In our area people truly appreciate the opportunity to extend the time they can spend outdoors and enjoy the natural surroundings or gardens of their homes. A three-season room can generally be used from April through November and perhaps even on moderate winter and early spring days. 1. Three-season rooms differ from year-round additions. Three-season rooms are designed to provide a sheltered space to enjoy an outdoor setting and to bring natural light into a home. They lack central air conditioning and heating. A fan can be added to circulate air to cool the room and a heater can be used to extend the use. Year-rooms have insulated double-pane glass windows and doors, a more efficient heating system and are insulated. Three-season rooms typically have single pane glass windows and may have insulation in the knee walls. The intent is to use the space eight months out of the year. Example: Large skylights provide the main source of daylight for this room. The interior of the room includes ceramic tile flooring for easy care and a ceiling fan to cool the room on warm days. three-season rooms unless you’re looking to extend the room’s use. A glass enclosure of a three-season room should provide a view of the outdoors, protect the room from the elements and insects, and use the heat of the sun to help warm the room on cool days. Windows should be screened, operable or removable to cool the room on warm days and closed on cold days when the room is not in use. Interior doors should be insulated to close the room off from the rest of house when air conditioning and heating is used to save energy. 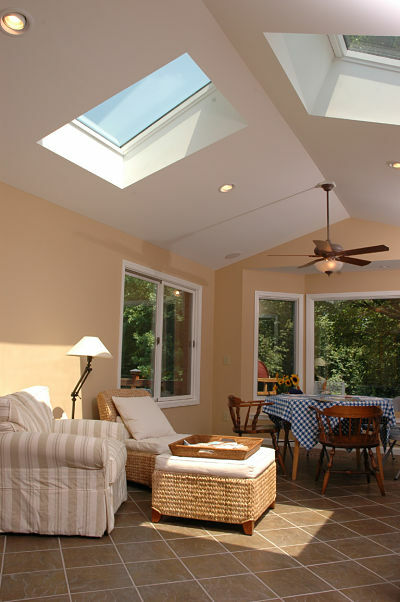 Skylights can provide more natural sunlight to the space and don’t need to be insulated. Example: Insulated windows and doors can be added to a three-season room. 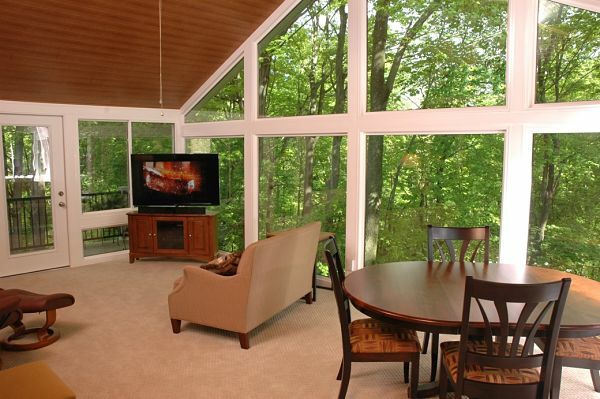 This three-season sunroom has operable double pane windows for ventilation, two glass doors and skylights. The roof is insulated. 3. A three-season room should be designed to be compatible with a home’s architecture. The overall design of a three-season room should complement a home and its outdoor setting. It pays to work with a design professional or contractor in determining the plans for a three-season room. There are building codes to address and permits required. 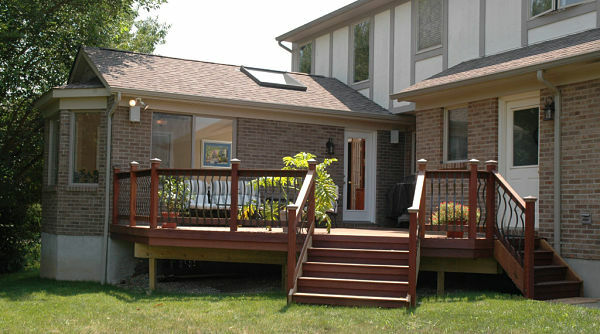 There may be structural issues to address if you plan to convert a deck or porch into a three-season room. 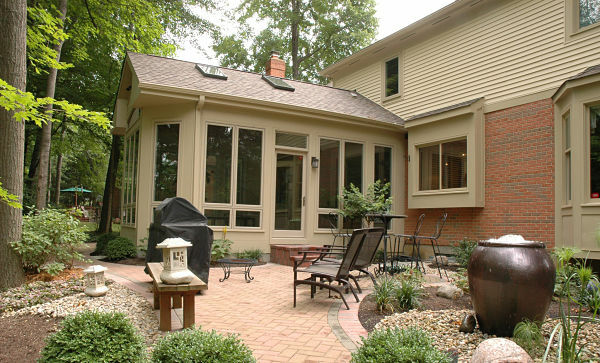 Example: A three-season room addition was matched to the exterior of this home to provide a view of the yard and entry on to a deck. Skylights were added and the roofline blends with the architecture of the home. 4. Three-season rooms rely on solar energy for heat and fans and screens to cool the room. These three-season room additions have some common features that include glass on three sides of the room, ceiling fans and an unobstructed view of the outdoors. Each room is designed to maximize use of natural light and solar energy. Example: The design idea for this room was to use large crank-out windows to bring the outside into the home. Four skylights provide natural lighting. The interior features a bead board ceiling with recessed lights and ceramic floor tile. Example: A traditional three season room usually requires two feet of walls in the corners for wind bracing. 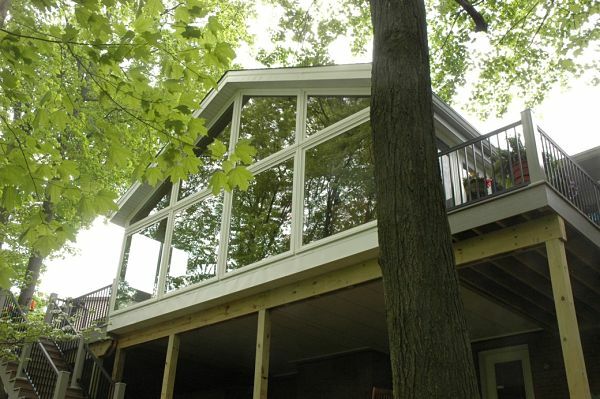 This homeowner wanted as much glass as possible to bring light into a home surrounded by tall trees. 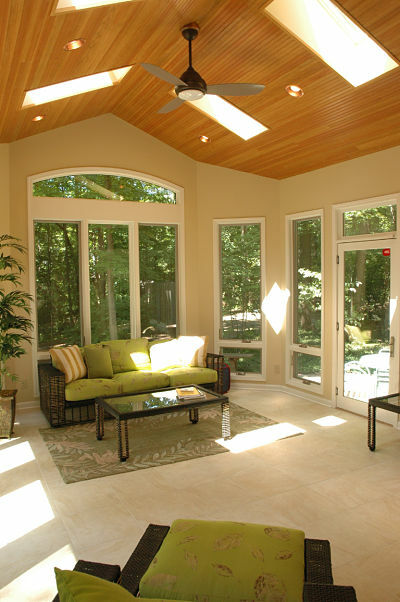 A custom designed and engineered sunroom provided the best solution. The windows use Low-E glass with special coatings that reflect heat back inside to warm the room in the winter and reflect solar energy away in the summer, all while minimizing damaging UV rays which cause furnishings to fade. The room is elevated and opens onto a deck. From the sunroom’s interior, there is a magnificent view of the mature trees on the property that is stunning in any season.